A printed career test helps you build awareness of your interests, personality, potential careers and possible degree programs. The cost for the printed RIASEC Inventory is $5. The Self-Directed Search Assessment is easy to use - Complete the career assessment in 30 minutes. The NEW fifth edition of the SDS is designed to help clients learn about themselves and their career options. Whether they are college students choosing a major, veterans entering the civilian job market, or adults pursuing a career change, clients can use the SDS to learn more about occupations that match their interests, abilities, and personalities. Like its predecessors, the SDS 5th Edition is based on John Holland’s theory that both people and work environments can be classified according to six basic types: Realistic, Investigative, Artistic, Social, Enterprising, and Conventional. These personality types are known collectively as the Holland RIASEC model. The SDS asks questions about the individual’s aspirations, activities, competencies, and level of interest in different occupations. From the responses, the SDS generates a three-letter Summary Code, which can be used to help the individual find his or her educational and occupational matches. This easy-to-use, comprehensive career exploration tool asks questions about the individual’s aspirations, activities, competencies, occupations, and other self-estimates. The resulting three-letter Summary Code, which designates the three personality types an individual most closely resembles, can then be used to help the individual find his or her occupational match. Applies to all stages of life. The components of the SDS 5th Edition can be used together for educational planning and career development, as well as leisure and retirement planning. Includes brand-new normative data. Normative data were derived from a nationally representative sample of 1,739 students and adults. Is well studied and psychometrically sound. 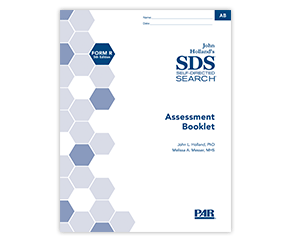 The SDS is one of the most thoroughly studied career assessment tools: the SDS results has been used in more than 1,500 studies. Sets the standard for career assessment. Used by more than 35 million people worldwide, the SDS was originally written by John Holland, the creator of the popular RIASEC theory of vocational personality. Uses a continually updated occupations resource. SDS Summary Codes are linked to occupations found in the Occupational Information Network (O*NET) database, a major occupational site used by consumers and professionals. The New! The Occupations Finder-Revised Edition has a list of 1,309 occupations matched to Holland Codes. The Form E Assessment Booklet is written at a 6th grade reading level. The directions are written at a 4th-grade reading level in larger print for easier reading. The Form E Jobs Finder lists over 860 jobs, including some requiring post-secondary training. As bonuses, with each purchase, you receive the Career Locator and Career Planning Worksheet. The Career Locator matches Holland Code interest areas to 600 careers. Careers are placed in one of the following groups – Careers that require Short Term On-the-Job-Training, Moderate Term On-the-Job-Training, Long Term On-the-Job-Training, Associate Degree, Bachelor’s Degree, Professional Degree, and Post-secondary Vocational Training. On the Career Planning Worksheet, you record information about education required, projected earning, job outlook, skills, and next step.